English painter. From a respectable but impoverished family, he left school aged 13 to be apprenticed to Francis Eginton of Birmingham, a glass painter and early pioneer in reproduction by a photographic method . The chiaroscuro effects of this process were a lasting influence on Phillipss style. In 1790 he moved to London to study at the Royal Academy and simultaneously assisted in Benjamin West s studio. He exhibited at the Royal Academy from 1794 to 1844 and was elected ARA in 1804, RA in 1808 and Professor of Painting in succession to Henry Fuseli from 1825 to 1832. As a portrait painter he was often more interested in the mind of his sitters than fashionable exteriors and caught the noble gloom of the romantic pose . 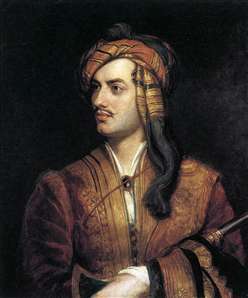 See more details about "Byron in Arnaout Dress"